Here I would like to tell you that when I was a kid, I didn't get to eat chikoo much. You see, this fruit wasn't local to my hometown and in those days eating local and seasonal was the norm. I remember having it the first time when we had gone to visit our grandparents. I remember enjoying it - it was sweet, tender and succulent. Today, I relish a scoop of chikoo ice cream as much. Now, I have one more weapon in my arsenal to beat the Pune heat this summer. The recipe is a breezy one, with no fancy ingredients. You can double or triple the recipe if you want to make it in bulk. 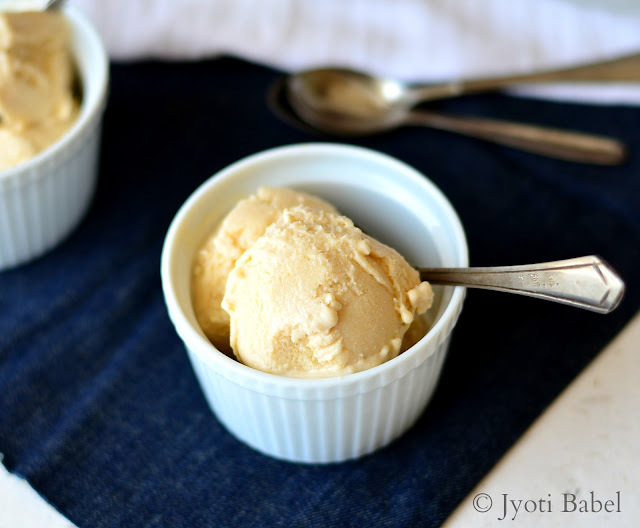 Here is how you can make Natural's style Chikoo Ice Cream at home. 1. Boil the milk in a thick bottom pan on low to medium heat till it is reduced to half in volume. It will take about 20 minutes or so. Keep stirring it while it heats to avoid burning. When done, let it cool down to room temperature. 2. Peel the fruit and cut them into chunks. Remove the seeds. 3. In a large blender jar, add the chikoo chunks and blend till finely puréed. Add the reduced milk and blend it for a few seconds. 4. Add cream to the mixture and blend it for another 1 minute. Now add the condensed milk and blend again for a minute so that the mixture is uniform. 5. Tip the mixture thus prepared in a freezer safe container. Put on the lid and freeze for 2 hours. 6. When it looks half frozen, take it out again and blend it in the mixer one more time and then put it back to freeze. 7. It will take about 5-6 hours to set. Take it out 5 minutes before serving. Scoop into serving bowls and enjoy! These can be frozen in kulfi/ popsicle moulds for chikoo kulfi. Use chikoo that are perfectly ripe and not overly ripe and mushy for best flavour. Instead of chikoo, you can use an equal amount of custard apple/sitaphal pulp to get sitaphal ice cream. Want to try mango, go ahead with mango pulp. this ice cream is no fail recipe just change fruits and freeze it. It was a cherished moment having ice cream with you dear. Wish i get few scoops of this ultimate icecream, i seriously miss chikoo here. I cant resist to those delightful scoops. Wow.. never tasted chikoo ice cream.. look rich and creamy. Loved the creamy texture of chikoo icecream , awsome recipe will try soon. Awesome share. I love chikoo. And this looks super tempting. Bookmarking it. Yummy! I am drooling! Perfect summer treat. That bowl of icecream is strongly needed in my part of the world right now with temperatures soaring and the heat seriously killing us. 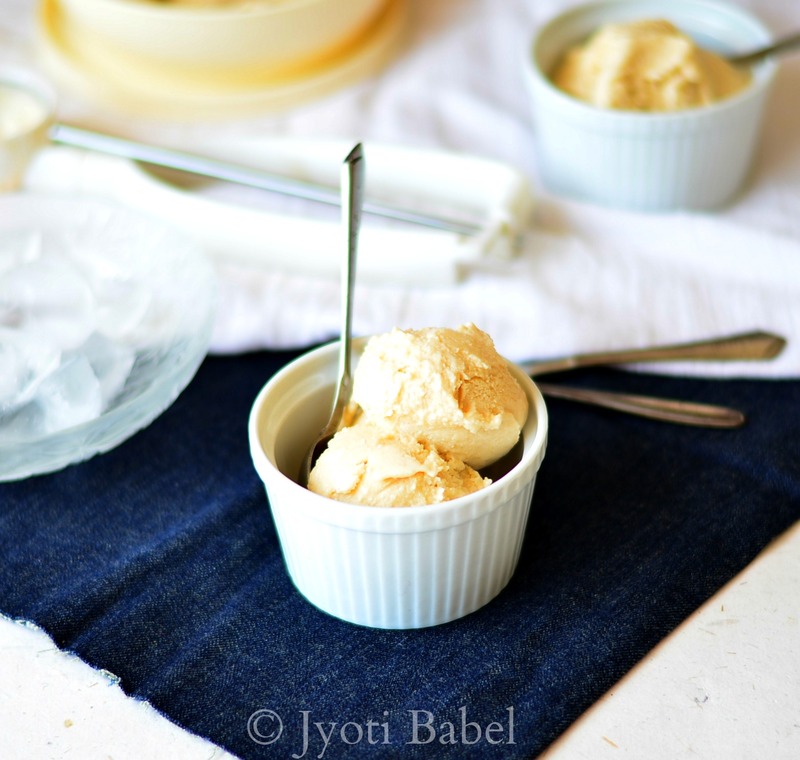 Interesting recipe and loved your attempt of making it in the naturals ice cream way. They are pretty famous with their seasonal flavours and I prefer eating there since there are no artificial colours used. I love Natural's ice-creams and this is one of my favourite flavours. Thank you for this simple recipe. So few ingredients and such perfect texture! I'll definitely go for chikoo because I love their deep sweet flavour. A wonderful way to make kids eat chickoo!! Love the color and these frozen scoops of ice cream are so tempting! I love fruit flavoured ice-creams than the regular ones.. And this is making me drool now :) Loved your post ! I miss chikoo here. This looks so delicious and creamy! Wow chiku in ice cream is a unique idea. I must say I miss chiku's here and some days when I crave for chiku are the bad ones. This is sure to be a hit! 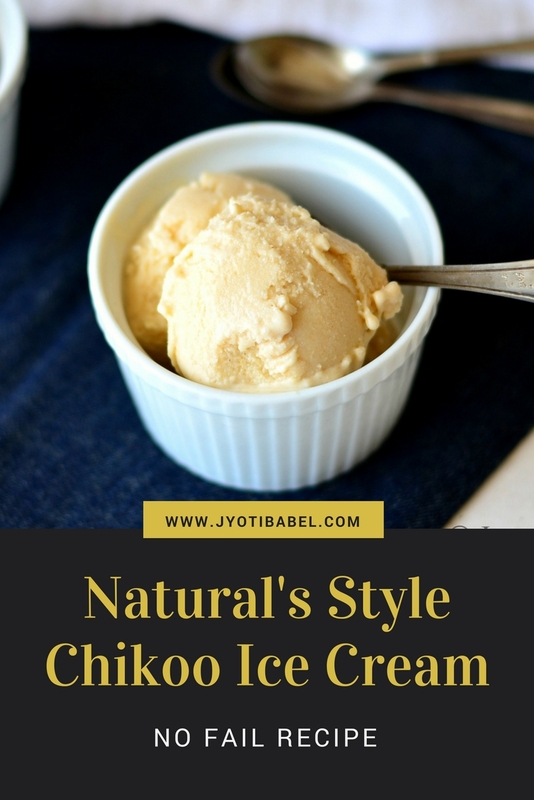 Love the flavor of chikoo ice cream Such home made ones are the best and we can safely give the kids to have as much as they want without worrying about preservatives and stiffs, right!